How Long Before Runaway Star Smacks into Something Big? Astronomers using NASA's Hubble Space Telescope have detected a blue star called HE 0437-5439 they say was unceremoniously expelled from the Milky Way and is now hurtling through space at 1.6 million miles an hour. Scientists say his rates as one of the fastest of the 16 so-called hypervelocity stars they've discovered since 2005. These sorts of exiled stars are rare. How rare? According to astronomer Warren Brown of the Harvard-Smithsonian Center for Astrophysics in Cambridge, Mass. 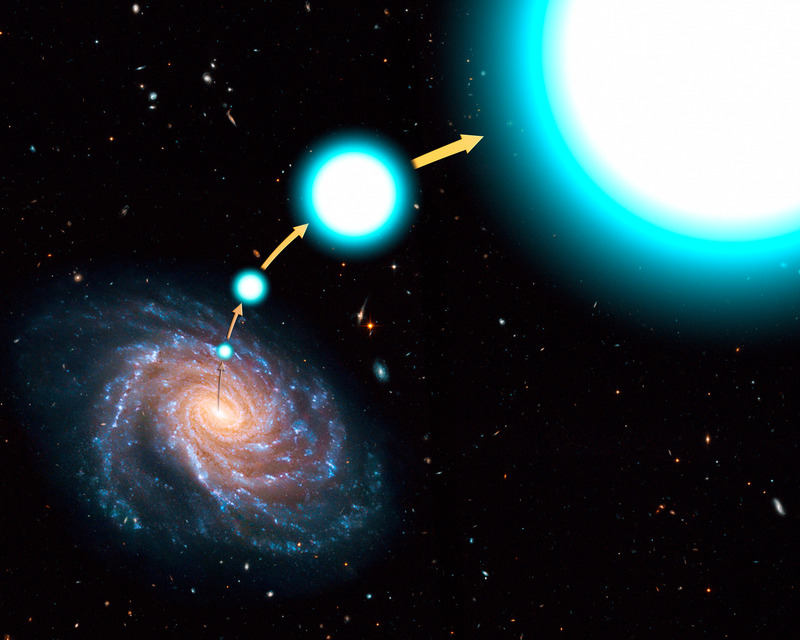 for every 100 million stars in the Milky Way's population of 100 billion stars, "there lurks one hypervelocity star," according to Brown, who also is lead author on a paper about the finding published online July 20 in the Astrophysical Journal Letters. The age of the star remains unclear as well as its origin. In a press release, NASA suggested that HE 0437-5439, then part of a "triple-star system," might have been created roughly 100 million years ago when it steered dangerously close to a giant black hole. At that point, the black hole may have grabbed one of the stars and ejected the other two from the Milky Way. Don't lose sleep, though, about the star heading for an apocalyptic collision with Planet Earth. HE 0437-5439 may be destined to roam through space but it's heading in the opposite direction. What it finds out there is another story.